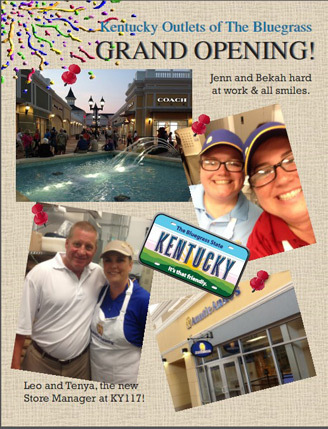 Outlet Shoppes of the Bluegrass Grand Opening! The Outlet Shoppes of the Bluegrass is a 366,750 square feet outlet mall located near I-64 in Simpsonville, Kentucky. The mall opened on July 31, 2014. Anchor stores include Saks Fifth Avenue Off 5th, Old Navy, Nike, Polo Ralph Lauren, and American Eagle Outfitters. This opening marks Chestnut Land’s 66th store and 15th state!